Here's a book for those who love aviation art, particularly military planes. 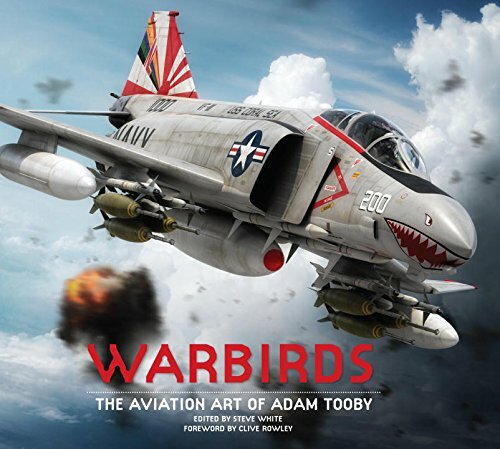 Adam Tooby only got into creating aviation art 6 years ago and now has an artbook filled with amazing artworks. That's really impressive. Warbirds is a large coffee table hardcover artbook that features more than 200 artworks of military planes from over the last 100 years of aviation. These planes are from before and after the first and second World War. Actually the most recent jet featured is the Mig-29 with its maiden flight in 1977. The book starts with a lengthy and insightful Q&A interview about his work and inspiration. At the end is a step by step breakdown, including screenshots, of how he models and textures the planes. It's not a tutorial where you can follow along though, but it's interesting to know the creative process. Tooby uses 3D Studio Max with Photoshop and Illustrator to create his artworks. He would visit museums and places where the planes are displayed to take hundreds of photos, then gather whatever blueprints and information available before modelling the planes in 3D. That is a lot of groundwork and his work rate is very inspiring. The artworks are wonderful, either rendered individually or featured in flights during war. Details are amazing, right down to the rivets on the legendary Spitfire, the shine of the metal, the weather worn paint peeling surfaces on the wings of the planes, or the words, logos and decorations on the plane bodies. The artworks are printed huge, sometimes across the whole 3 page gatefold. Each plane featured comes with specifications, a writeup on the history and variations of upgrades. There's a lot to read and should appeal to aviation or World War buff. This is a beautiful and informative book. I hope there will be future volume covering planes that weren't included this time round.